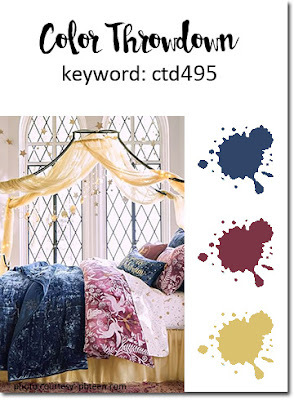 Another Wednesday means it's time for another Color Throwdown challenge! 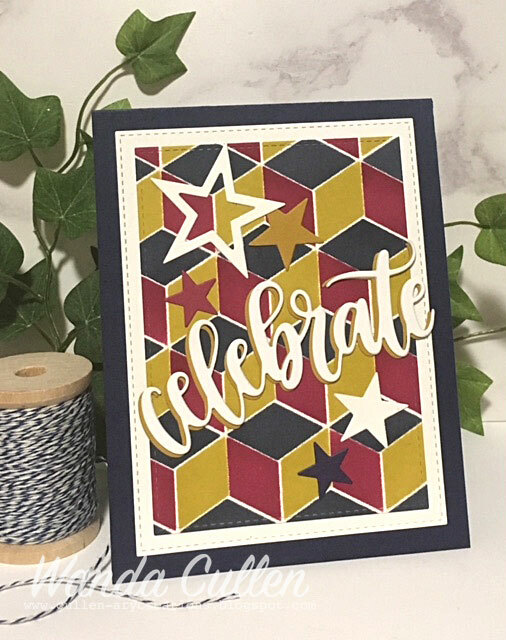 Jodi is hosting and has a unique color combo - navy, burgundy and gold...perfect for a masculine birthday card I needed to make! I decided to dust off my neglected Cube Builder stencil by Altenew and used Hello Honey, Night of Navy and Purely Pomegranate inks by Stampin' Up. The sentiment, stitched rectangles and star dies are all by My Favorite Things. I can't believe this is the last Wednesday in May which means we have to say goodbye to our May guest designer - Rachel Alvaredo. Be sure to stay tuned when we introduce the June guestie with the next CTD challenge. I'm squeaking in under the wire for the MFT Wednesday Sketch Challenge! 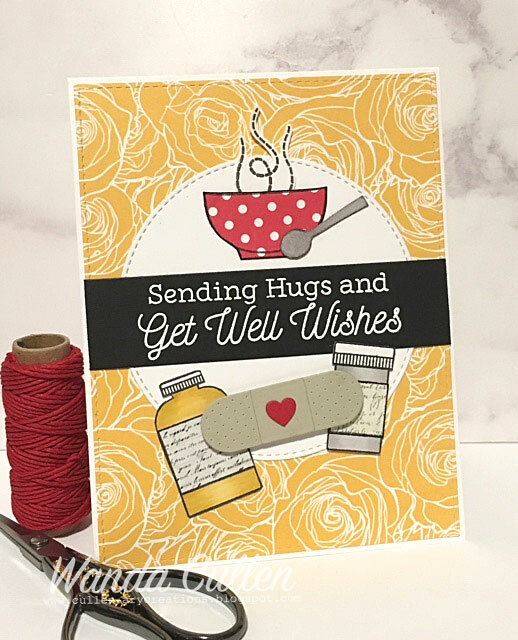 Paper piecing is such a fun technique with the images in MFT's "Feel Better" stamp set with matching dies. The background patterned paper is from MFT's Roses All Over 6x6 pad. The sentiment was white embossed on black. TIP: After fussy cutting your images (cup and pill bottles), use a black marker to run over the edges to give it a more definitive look! Taking a wee break this afternoon before more prepping for our family cookout this evening. Hope everyone is enjoying this special commemorative holiday! 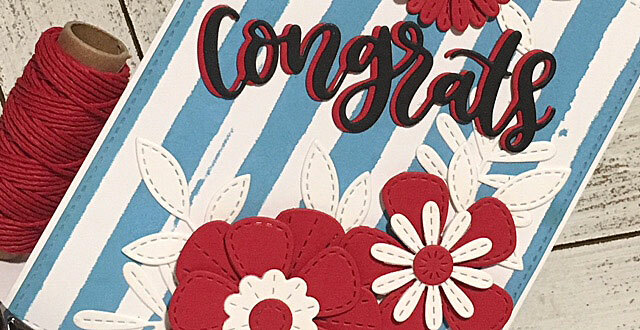 Though I didn't go with a patriotic theme, the Make It Monday Challenge over on the Papertrey Ink blog is to create a card with cascading die cuts, so you know I was definitely going with florals! I already had the watercolor panel in my leftover pile, so I quickly die cut the postage frame and layered this lovely stamped image from PTI's Garden Grace stamp set with matching dies. STAMPS: Garden Grace, Tiny Tags (PTI). PAPER: Aqua Mist, White (PTI). INK: Bright Buttercup, Harvest Gold, Green Parakeet, New Leaf, Aqua Mist (PTI); Versafine Onyx Black. 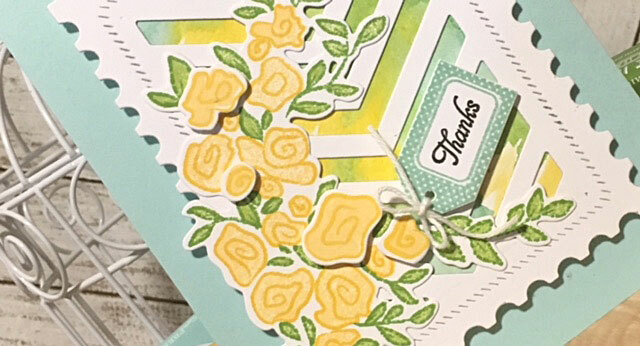 DIES: Garden Grace, Tiny Tags, Mix and Mat Postal die (all PTI). 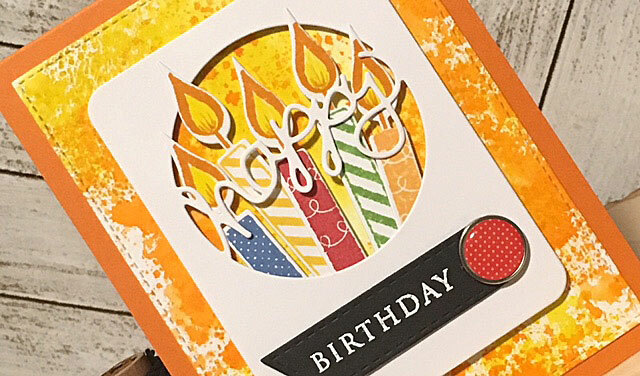 I added another birthday card to my stash using these candle images and happy frame die by PTI. I hand colored the inside of the flames with a yellow Tombow marker then flicked a tiny bit of orange marker at the base of the flame. The background was created by smooshing Carved Pumpkin, Squeezed Lemonade and Mustard Seed distress inks on acrylic blocks, spritzing with water, then picking up the ink by blotting a panel of watercolor cardstock over it (be sure to dry each color with a heat gun before you change colors). 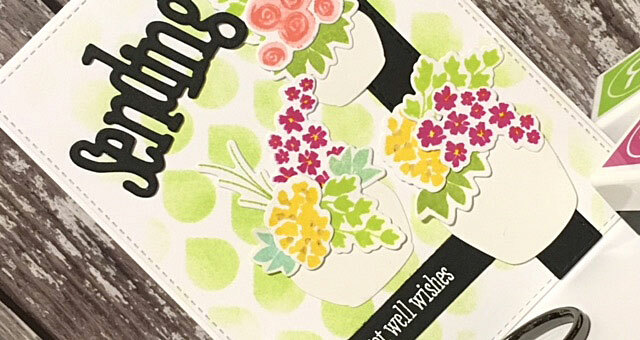 STAMPS: Polka Dot Parade #12 (PTI) - candles; Wreath for All Seasons (PTI) - sentiment. INK: Blueberry Sky, Bright Buttercup, Pure Poppy, New Leaf, Summer Sunrise (ink cubes by PTI); Ranger distress inks as noted in description; Versamark. DIES: Phrase Play 5 Die (PTI); Stitched Rectangle STAX Die-Namics by MFT; Polka Dot Parade #12 (PTI) - candles. Tuesday Challenge since I'm needing a boatload of masculine birthday cards in June. I went back into my archives and found this card on the right and transformed it to a more masculine feel (cooler colors, sentiment on black instead of vellum). I already had this panel of Yupo paper that was covered with alcohol inks (green, blue and metallic silver) and used that as my starting point. I am finally getting around to inking up PTI's Butterfly Folk set using Tropical Teal and Green Parakeet inks (also by PTI). They were die cut with matching dies and popped with foam tape. The sentiment is from PTI's Direct Messages stamp set. The Yupo panel was adhered to a panel of Hawaiian Shores cardstock. Happy Saturday everyone! I haven't been in my crafty space for several days, so decided to get inky after our daughter went back to her latest "home" in Spartanburg, SC, where she works as a traveling nurse. 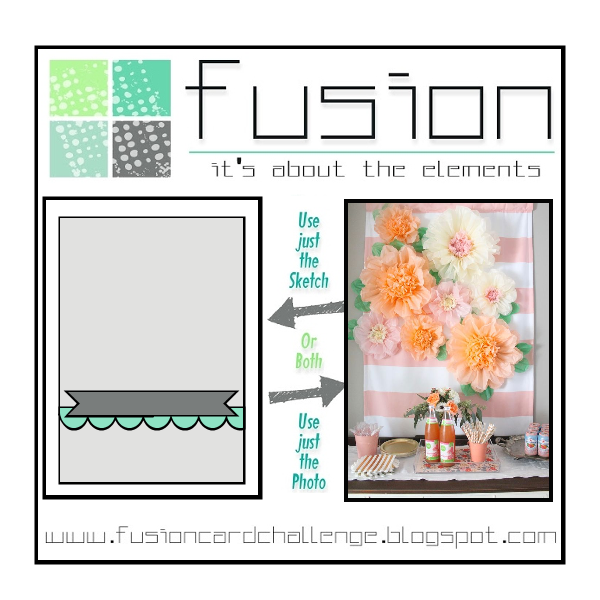 I really loved both the sketch and the inspiration photo for the current Fusion Card Challenge, so played along with mostly Altenew products. This Bitty Big: Sweet Blush patterned paper by PTI was perfect for the background. 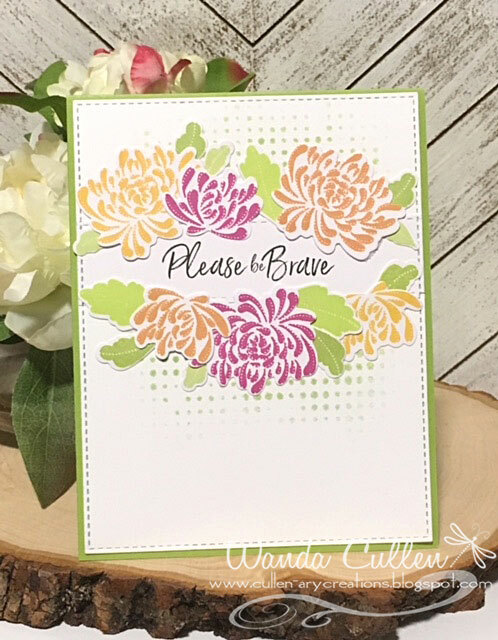 I layered up some die cut scraps using the Peony Dream 3D die (Altenew) and white embossed the sentiment from Altenew's Painted Greetings stamp set. The scallop edge is Reverse Confetti's Double Edge Scallop Border. I used my SU corner frame punch to create the notched ends on the sentiment strip. 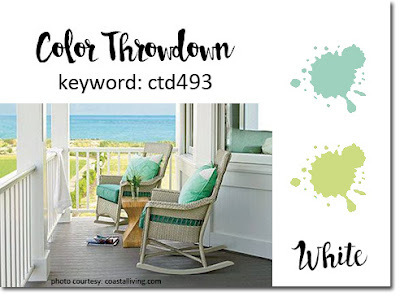 It's hump day and that means there's a new Color Throwdown Challenge going on! 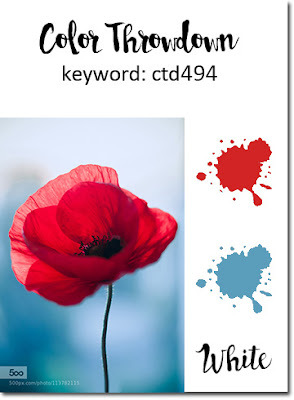 We have a patriotic color combo for you if you want to go that direction, but it's great for other themes as well. 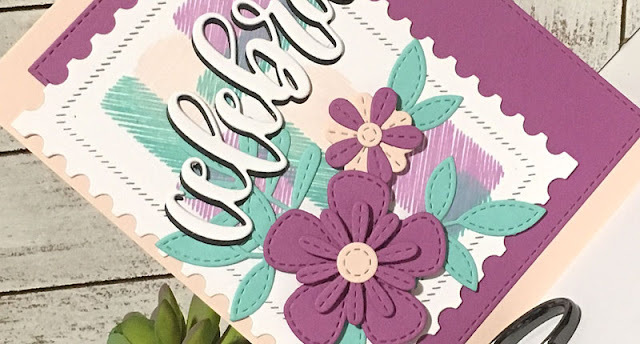 Since the photo is a floral theme, I once again went with using these versatile Stitched Blooms dies by MFT! There are endless ways you can combine these dies for SOOO many different kinds of posies! 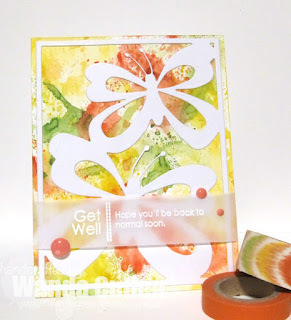 I used Broken China distress oxide ink with the Watercolor Stripes stencil by Altenew. 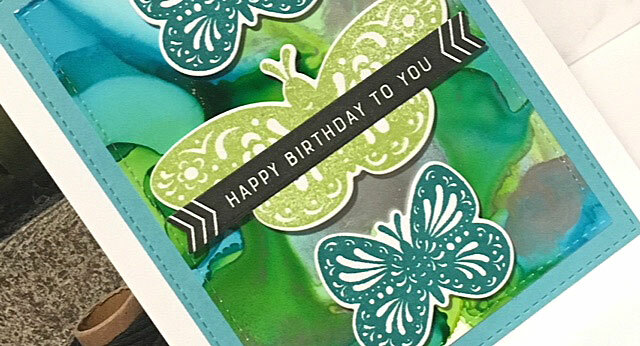 The sentiment die is a recent purchase from MFT and it was die cut three times to give it more dimension. 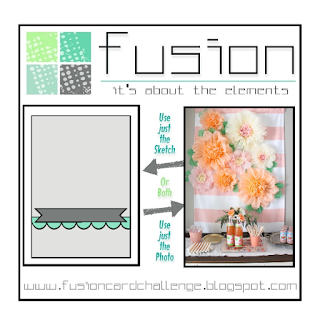 Below Challenge on the PTI blog post for Monday! 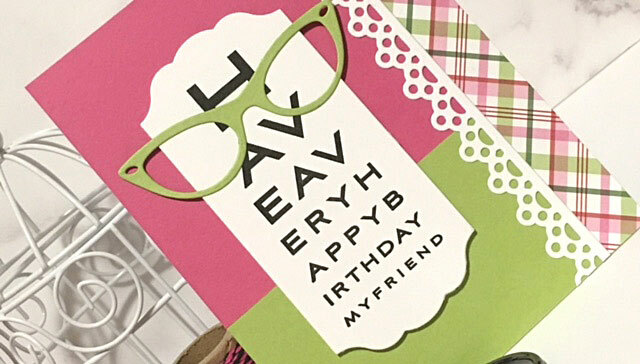 You can check out her card here to the right. 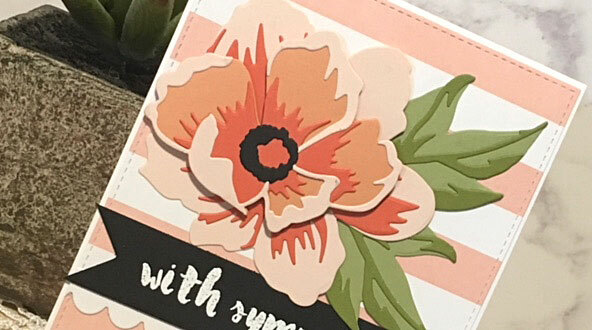 My attempt was not successful IMO as I covered up too much of the sentiment strip by overlaying the florals instead of tucking them underneath. I am definitely planning a redo! 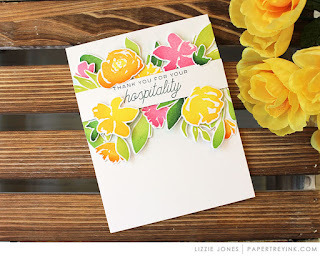 I also didn't add the shading of the florals as Lizzie demonstrates in her video on the blog post HERE. You will want to see how she accomplishes this amazing detail! 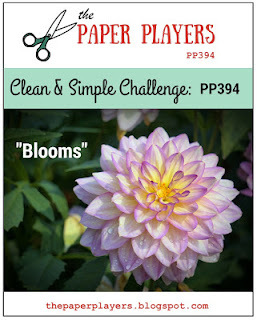 I'm also entering this into the Paper Players Challenge which is to create a CAS design with blooms. To add an element of texture, I stenciled the background lightly with Parakeet dye ink using Tim Holtz' Dot Fade stencil. Even my ink choices were an epic fail - lol! My yellow and orange colors (Bumblebee and Tangerine) were too close to the same shade and my pink (Magenta) ending up being darker than I wanted. Oy. Live and learn! STAMPS: Mums the Word (PTI), Pen and Ink (PTI). PAPER: Lime Green (Reverse Confetti); White (PTI). INK: Bumblebee, Tangerine, Magenta, Lime Green, Parakeet, Pistachio by Reverse Confetti. 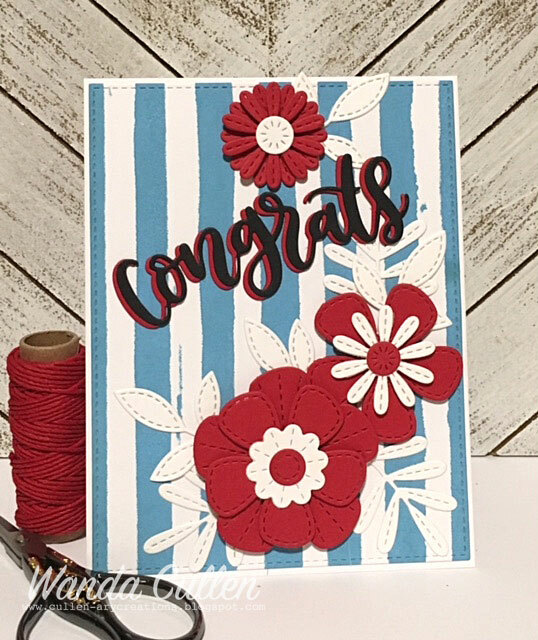 DIES: Mums the Word (PTI); Stitched Fishtail Flags STAX Die-Namics by MFT. MAY 22 - "You're free to make your own choices, but you will never be free of the consequences of your choices." It's time to be inspired by another lovely photo for the Inspired By All The Little Things Challenge! 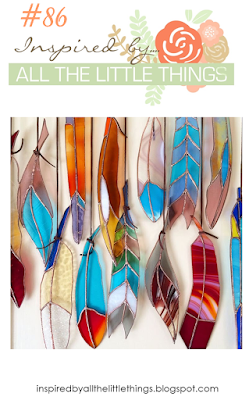 The "veins" in the stained glass feathers appear to be a golden metal so that inspired me to die cut a variety of gold feathers. All the vivid colors also inspired me to use this panel of Yupo paper with some bright alcohol ink colors. We'd love to see how YOU are inspired, so hope you can join us! 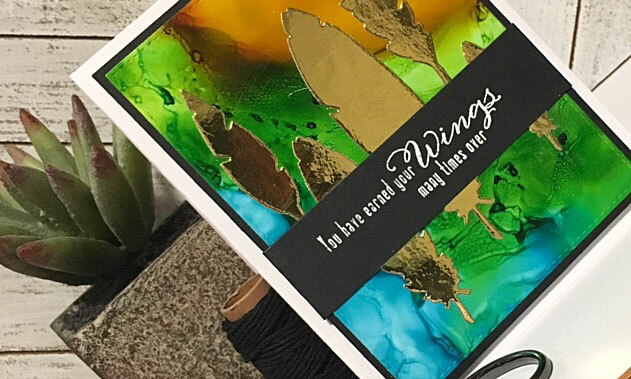 The sentiment - You have earned your wings many times over - comes from Waltzingmouse Stamps' Fine Feathers retired stamp set and was white embossed on Black Licorice cardstock (MFT). Thanks so much for stopping by and commenting! Hope to see you in the Inspired By gallery! Yet another rainy day here in VA which doesn't get any gardening accomplished but it does give me a good excuse to retreat into my craft room! 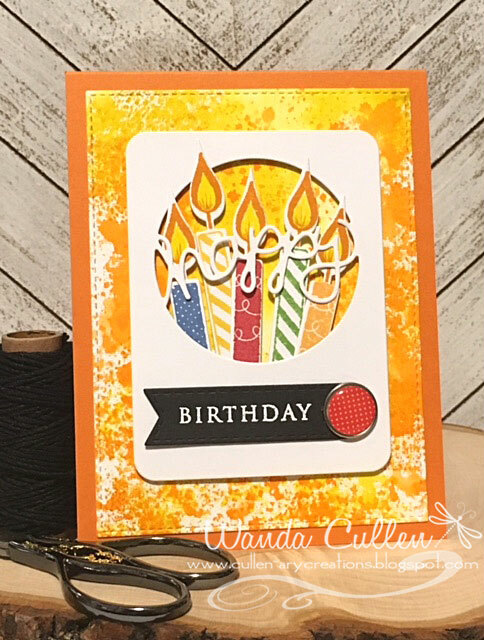 I'm playing with The Card Concept Challenge and also with Simon Says Stamp Wednesday Challenge which is to use a stencil. 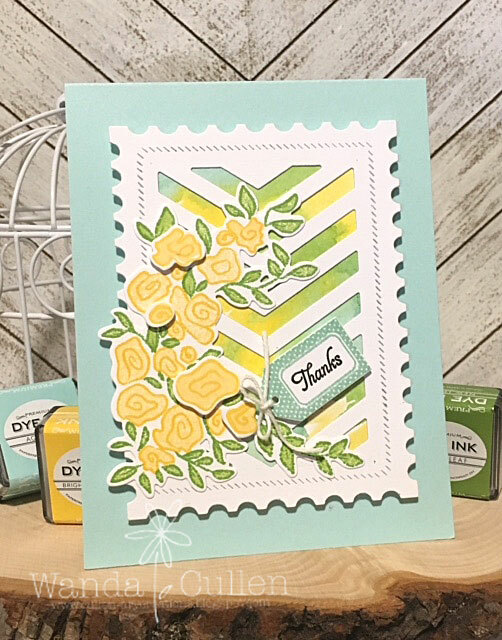 Since SSS is sponsoring it, I used their Ledger Drops stencil with Ranger Twisted Citron distress ink for the background. The inspiration photo led me to create a trio of flower pots using WPlus9 stamps and dies. I wanted the flower pots to have a shiny finish to resemble pottery so cut them from glossy cardstock. I went with a clean, layered style and was inspired by the pale green BG and variety of floral colors. 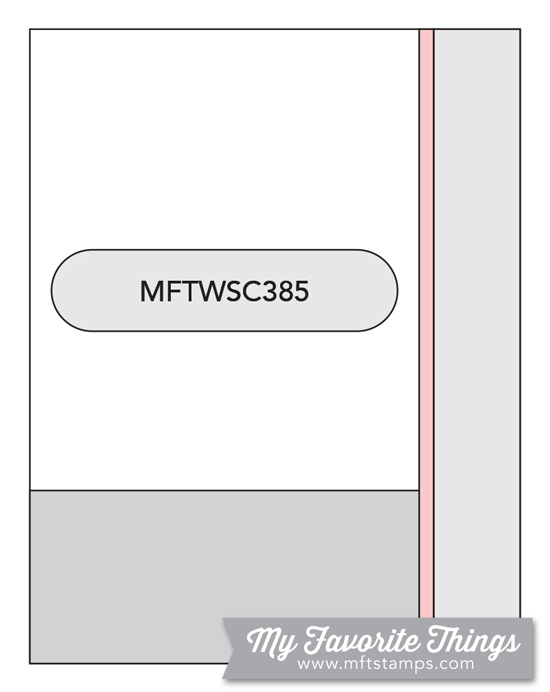 STAMPS: Fresh Cut Containers (WPlus9), Sending, Hoping, Wishing (WPlus9). PAPER: White and Black by PTI. INK: Bumblebee, Sunshine, Parakeet, Lime Green, Iced Aqua, Coral, Magenta - dye inks by Reverse Confetti; Twisted Citron distress ink used with stencil. 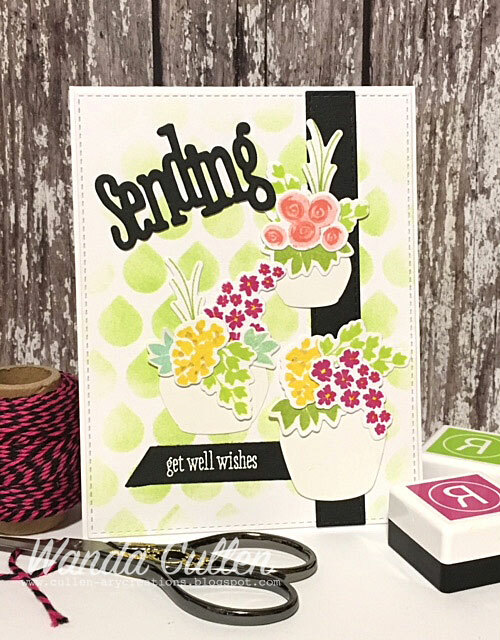 DIES: Fresh Cut Containers and Sending, Hoping, Wishing - WPlus9; Stitched Rectangle and Stitched Fishtail Flags STAX Die-Namics by MFT. An ongoing rainy day just lends itself to getting inky! 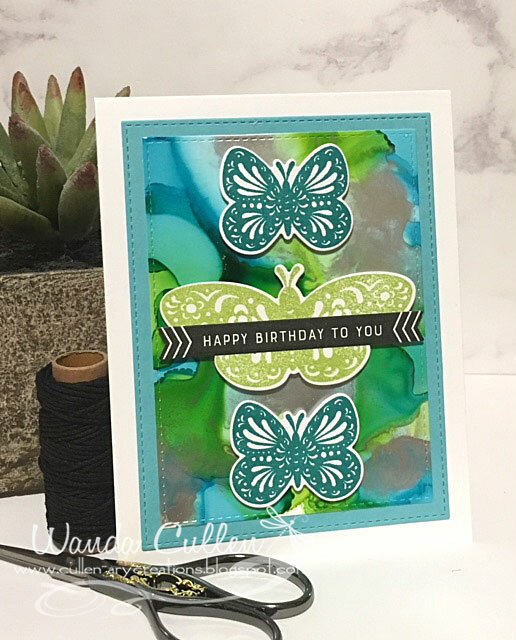 This is my second card for the day...this time for the MFT Wednesday Sketch Challenge and also for MFT's monthly Birthday Project Challenge. 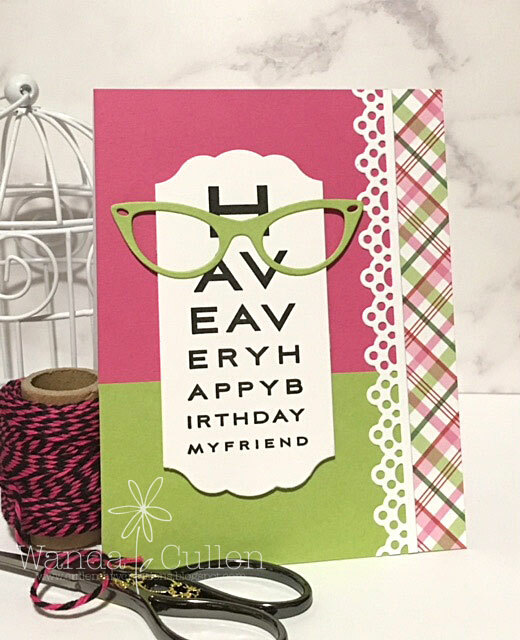 I dusted off this older stamp set for a fun, simple card using MFT stamps, dies and papers. It's pretty self-explanatory, so I'll just list the "ingredients" below. PAPER: Plaid Patterns Merry and Bright 6x6 pad (MFT), Ripe Raspberry, Sour Apple (MFT), White (PTI). INK: Versafine Onxy Black (stamped twice using a MISTI). 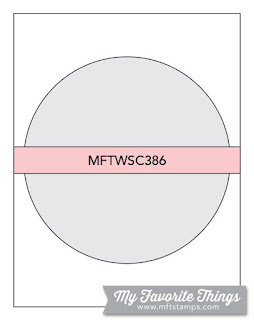 DIES: Dainty Lace, Geek is Chic - Die-Namics by MFT. Hello blog friends! It's a cloudy Thursday with more rain in the forecast. I'm feeling crafty today and am joining in the Freshly Made Sketches challenge where Linda has a fabulous new sketch for us! I've been trying to use up some items in my scrap pile, so this postage panel with the stamped shapes was leftover from a former Color Throwdown color combo. I had to go into my SU retired cardstock file to find matching colors. 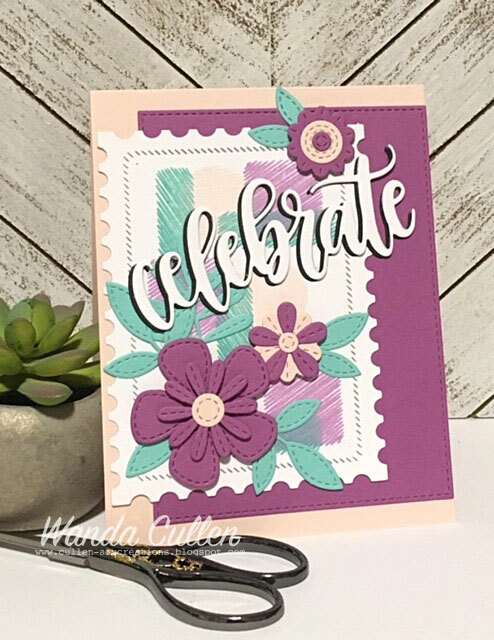 The Stitched Blooms dies by MFT are so much fun to mix and match and make it so easy to whip up a quick card. 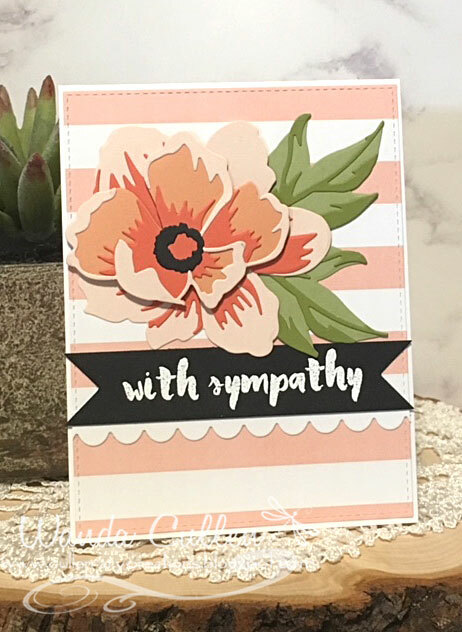 The sentiment was die cut three times - twice with white and once with black CS. I offset the black layer slightly so it made it pop more against the background. 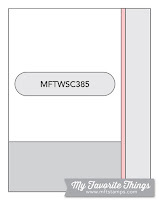 STAMPS: Greetings and Salutations (WPlus9). 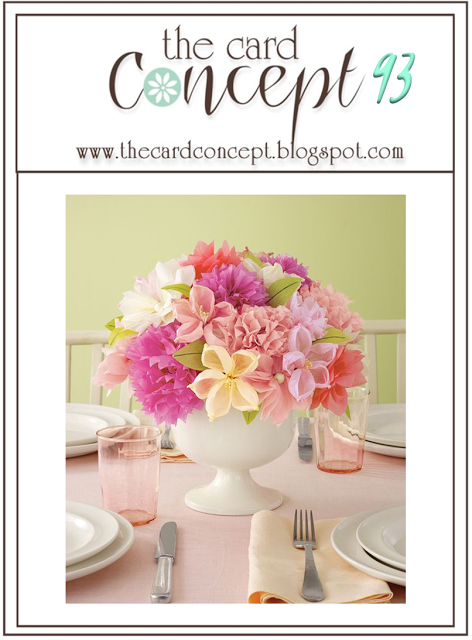 PAPER: Marvelous Magenta, Blush Blossom, Coastal Cabana (SU); White (PTI). INK: Coastal Cabana, Blush Blossom, Marvelous Magenta (SU). 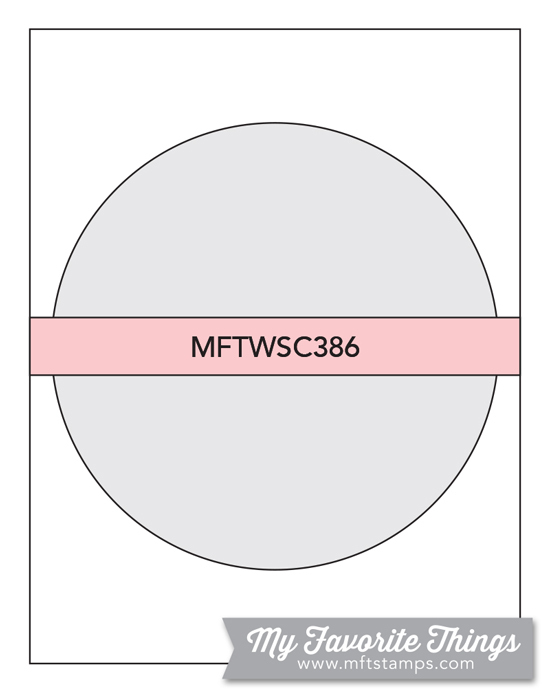 DIES: Stitched Blossoms (MFT), Celebrate (MFT), Mix and Mat: Postal Die (PTI). The weeks keep rolling by so quickly during this favorite month of mine and it's already time again for another Color Throwdown Challenge. You are going to LOVE these beautiful colors - aqua, lime and white - that Broni has chosen! With inspiration from the seaside photo, I was immediately drawn to this older Hero Arts stamp set called Color Layering Seahorse. 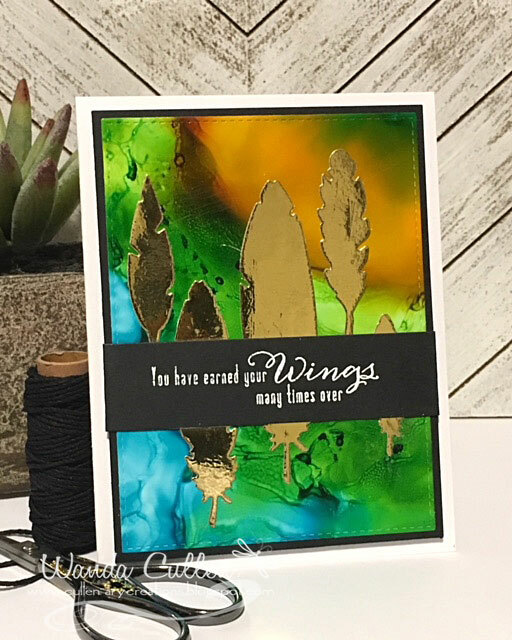 I stamped some splatters from SU's Gorgeous Grunge set, then stamped the old map image from SU's The Open Sea set with Twisted Citron distress oxide ink. The edges were torn and sponged with the same ink. Using the Mini Specimens stencil by TCW (Rebekah Meier Designs), I added texture with Liquitex light modeling paste. The sentiment is white embossed with Altenew's Pure White opaque EP. A trio of dew drops added the finishing touch! 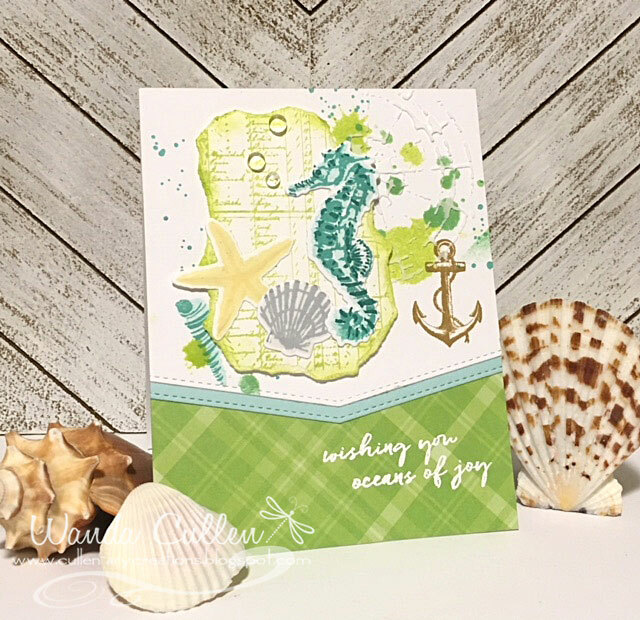 STAMPS: Color Layering Seahorse (Hero Arts), Gorgeous Grunge (SU), The Open Sea (SU). PAPER: Perfectly Plaid Rainbow pack by Lawn Fawn, White by PTI, ? light blue cardstock from my leftover pile. INK: Twisted Citron distress ink; Old Gold, Fairy Dust, Silver Lining, Hayride, Falling Star, Ocean Drive, Siren Song dye inks by WPlus9; Versamark. 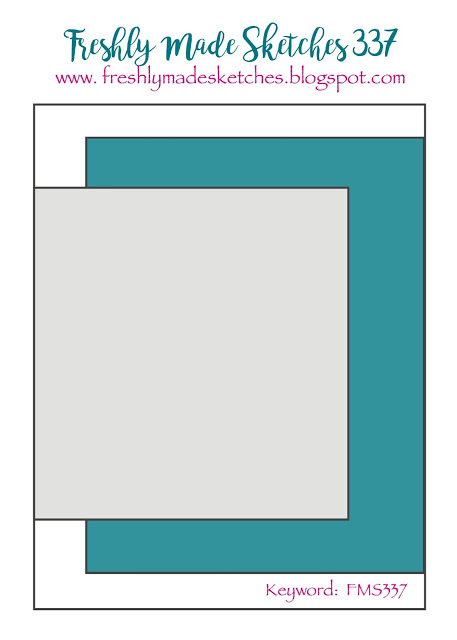 DIES: Color Layering Seahorse (Hero Arts); Stitched Basic Edges (MFT).